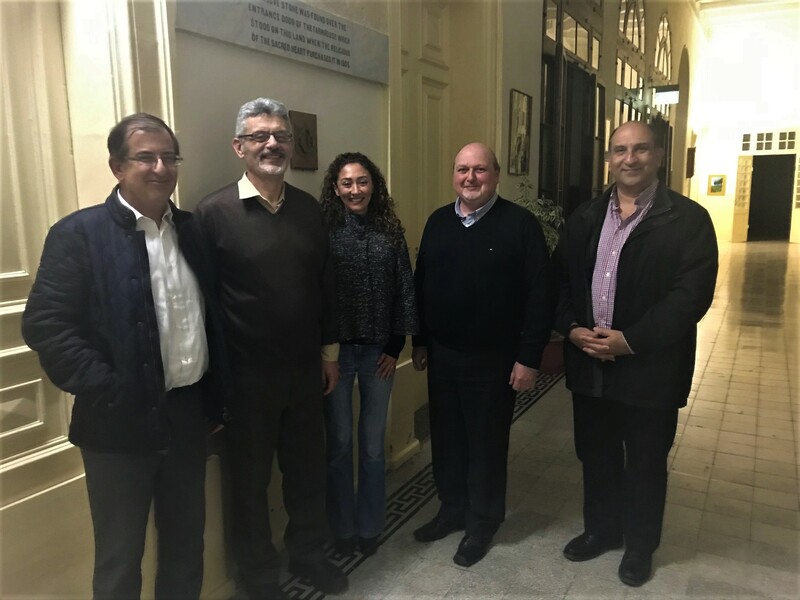 As part of our mission to enable more Catholics to be a relevant voice in society during the months of March and April, Catholic Voices Malta organised a course for four participants keen on being a voice through the written media. The course dealt with issues like the Communication Triangle i.e. distinguishing between audiences, the purpose of the article and the Catholic Voices method of communication; the distinction between editing and revising and learning how to give and receive feedback. The course also focused on writing for effectiveness and exploring different writing strategies and rhetorical devices, identifying the article to respond to and formulating the Catholic Voices Reframe methodology. The course participants found the course a strong learning experience and we all thank Sandro Spiteri for designing and delivery of the course. The Vatican today published Pope Francis’s reflection on the 2018 Synod of Bishops on young people. The reflection is titled “Christus Vivit” (“Christ Lives”), and is a letter to young people about their place in the Church and a plea to older members of the Church not to stifle the enthusiasm of the young, but to offer gentle guidance when needed. 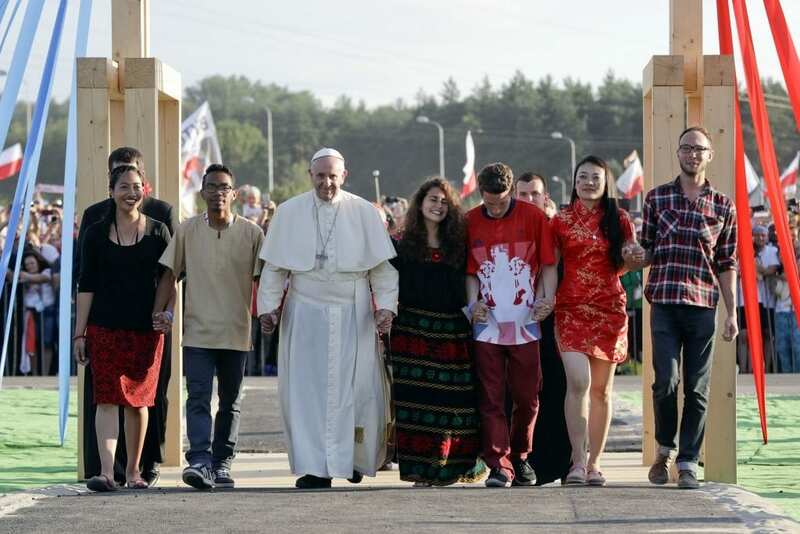 The Pope describes the life of a young person and the vocation to which God calls each one of them as “holy ground”. 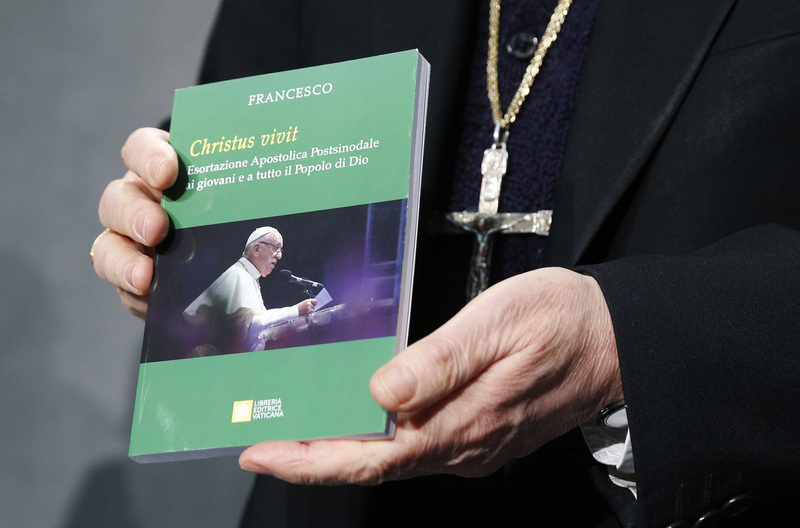 Cardinal Lorenzo Baldisseri, secretary-general of the Synod of Bishops, holds Pope Francis’ apostolic exhortation, “Christus Vivit” (Christ Lives), during a news conference for its presentation at the Vatican April 2, 2019. The document contains the pope’s reflections on the 2018 Synod of Bishops on young people, the faith and vocational discernment. (CNS photo/CNS photo/Paul Haring) See POPE-EXHORTATION-YOUNG April 2, 2019. For most young people that will mean marrying, forming a family and working, the Pope said. 29 December 2018 – Tonio Fenech for Catholic Voices Malta participates on the program Immagini presented by Christine Delicata. The program focused on the objectives of Catholic Voices Malta and other related issues. 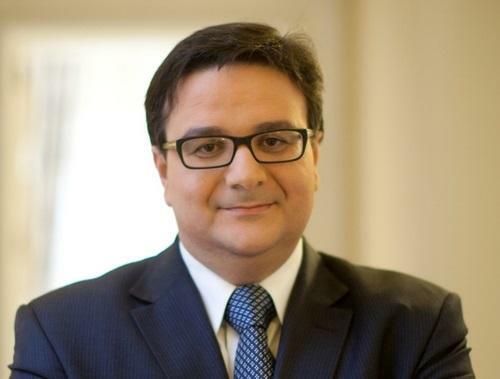 Former Finance Minister Tonio Fenech has issued a warning about Malta’s current economic boom, highlighting that the economy needs better management as while the country registers positive economic growth, a number of negative impacts are also visible and growing. Talking to The Malta Independent on Sunday, Fenech questioned what the impact of Malta’s current economic reality is, which, while having positives such as economic growth, is also having negative impacts. He said that when importing cheap labour to sustain economic growth, in terms of the theory of supply and demand, if supply is meeting demand at a low price, then these low wage levels become the benchmark for the rest of the economy. He said that Maltese workers who aspired to have a better a wage while working in the construction sector are having their ambitions frustrated, “as they will be told they are not needed as workers paid €800 a month could be brought in from abroad to carry out the same work”. So in reality, who is benefiting from this economic growth? The country’s economic strategy should have Maltese families as its core focus; in reality, it is not benefiting Maltese workers, but only benefiting the major companies undertaking these major projects, he said. A second major impact in relation to this reality is the housing required to support imported labour, he said. “We are not seeing the pacing of projects and it seems that the authorities have decided to give blanket approvals to massive projects, all coming up at the same time, which in itself is overheating the situation,” he argued. Asked whether, theoretically, Maltese would go for more well-paid jobs, he said he hopes they will be able to find such jobs, but the rates of say early school leavers is still an issue. “The unemployment rate is low but this does not mean that the level of wages workers are paid is adequate. Unfortunately, with the pricy rise in the property market, people with an average wage are finding it difficult to buy. Even rents are very high. When you talk about paying €1,000 a month for a decent apartment… how many people earn €20,000 to €24,000 a year? There are also many people buying property to rent, and this is also creating an artificial demand. People think that as many foreign workers are coming to Malta, they purchase a property, fix it up and rent it. But this is only sustainable as long as more and more foreign workers continue to come to the islands.” He questioned whether the country’s infrastructure could handle this, and highlighted the environmental impacts such a situation could create. Asked what could be done in order to minimise the issues he mentioned and the negative impact of the current economic boom, he said there are measures which can be taken, like pacing the projects approval process. He said that, in terms of the number of foreign workers, the government needs to study the situation in order to ensure that this policy is not having a counter negative impact on housing markets, unreasonable low wage pressures and rights. If one looks at what other countries did when it came to importing labour, they were more restrictive, he said. “First of all we have opened our doors to anyone in the world when we are already in the EU. Obviously, contractors would prefer to bring in workers from outside the EU as wages would be lower. If you leave it in the hands of developers and the business community, they will go for the cheapest option as their motivation is, obviously, to maximise profits. That is why we need a government that will balance the drive for profits with other social aspects that meet our economy. The “Protection of Minors in the Church” Meeting of Bishops, which will take place in the Vatican, between 21 and 24 February 2019. Faced with widespread and growing discomfort with revelations of very serious cases of sexual abuse involving members of the clergy, Pope Francis has called a 3-day meeting in the Vatican for Bishops that starts tomorrow the 21st February, 2019. The meeting will discuss the ‘The Protection of Minors in the Church’. The Pope has summoned the highest representatives of the Catholic Church from around the world to give a united response at the universal level. The entire Church must choose to live in solidarity, above all with the victims, with their families and with the ecclesial communities wounded by the scandals. As the Pope has written, ‘If one member suffers, all the members suffer together’. (1 Cor 12:26). The Church is seeking to send a clear message of its commitment to protect minors, and that this has to be done in a clear and effective manner by the entire community, starting with those in the highest positions of responsibility. More recently, other forms of abuse are coming to light, but all are rooted in the same culture of secrecy, abuse of conscience and abuse of power that are the cancer of clericalism that Pope Francis condemned in his Letter to the People of God issued in August 2018. In it he stated categorically: “to say ‘no’ to abuse is to say an emphatic ‘no’ to clericalism.” Pope Francis has concretely shown his zero tolerance for abuse by even those in the highest ranks within the Church, most recently by defrocking the ex-Cardinal McCarrick. The three days of discussion will be devoted to a specific topic: “Responsibility, Accountability, and Transparency”. The 190 participants present in the Vatican Synod Hall will hear three reports a day, three of these by women, and all nine interventions will be followed by a question and answer session. Members of the Organizing Committee will also meet privately with representatives of the victims and survivors’ associations. There will be testimonies from survivors and moments of prayer, at the beginning and end of each day. Pope Francis will open the Meeting with an introductory speech on Thursday morning, and close it on Sunday with a discourse after Mass. A Penitential Liturgy will take place on Saturday afternoon, and will be broadcast live. Catholic Voices Malta joins Catholic Voices International and indeed, the Universal Church and all people of good will in praying for Pope Francis, our Archbishop Scicluna who is in the team leading the meeting, and all the participating Bishops. This great moment of trail for the Church can be a turning point for its purification. 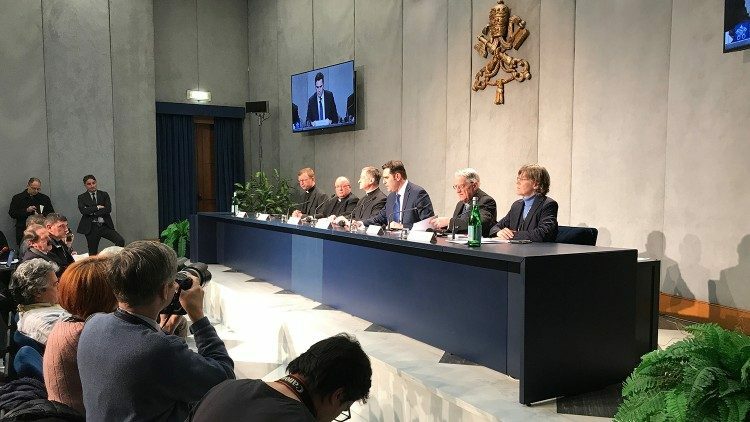 The official website of the “Protection of Minors in the Church” Meeting is www.pbc2019.org and will remain active even after the Meeting is over, as a “tool for developing future initiatives”. During the past two weeks much has been written about the phenomena of low Sunday mass attendance, what this implies, and possibly who’s to blame. The Humanitarian Association was quick to claim victory for secularism and asserting that Malta is no longer a Catholic country. While the actions of those who live the Catholic faith are more important that the numbers that go to Church, a proper look at the figures shows a reality quite different of what has been portrayed in general. The Maltese Archdiocese for the first time, commissioned a Survey to accompany the Census. Some were confused by this and questioned the need. I thought it was well thought. The Census listened to the people coming to Church, the survey sought to listen to the people not coming to Church, equally or possible more important to understand. The survey carried out by Misco in fact makes some interesting reading. 95% believe in God, something good, showing people still have an openness to the spiritual reality. 92% believe they are Catholic, 7% do not follow any religion while 1% adhere to some other religion. If 95% claim to believe in God, then out of the 7% that do not follow any religion, 1/3 still believe in God, i.e. only 5% of the Maltese population is either atheist or agnostic. Interestingly these results are not very far from a survey carried out by Malta Today around March 2018, that also found that 93.9% of the Maltese population identified themselves as Catholics. The survey then had also found that 88.8% were against the removal from the Constitution of Catholicism as Malta’s official religion and an even stronger majority was against the removal of the crucifix from public buildings such as schools. Focusing again on the more recent Misco survey, 93% claim that religion is important to them (66% claiming very important), even if simple maths tells us that not all of these attend mass every Sunday with some actually not attending at all. Evidently the Maltese Church needs some sole searching to understand why so many believe in God, feel Catholic, see their faith as something important, but do not find Sunday mass as relevant in their journey of faith. Most Catholics find themselves somewhere in between two extremes. Those who for them Sunday mass observance is the start and end of what it means to be a Catholic, just like ticking the box, or having a membership card, to the other extreme, where I noted many online individual comments to these stories seem to come from, that to be a good Catholic one does not have to go to Church. Only 37% state that one must follow a religion if one believes in God, which possibly explains why the census found that only around 40% attended Sunday Mass on census day. 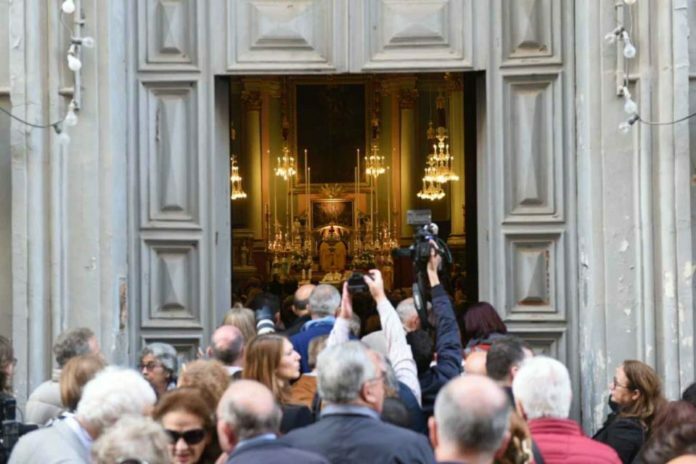 The survey on the other hand also found that 74% actually go to mass at least once a month, with 50% of the respondents claiming to have attended mass the previous Sunday. Here we find a discrepancy between the census and the survey. The census counted 40% while the survey measured 50%. The survey analysis seeks to explain this by making a mention that there is an element of social desirability bias, i.e. people reply what is expected from them as “good” behaviour. While this may be so, there may be a different reason like people who in a month go to Sunday mass more frequency then once, but not necessarily every Sunday, feel justified to place themselves in the category of regular Church goers rather than occasional. I also found it very strange that despite all that has been reported, officially by the Church, journalists and various commentators, one important figure seems to have been overlooked. 75% of the respondents claimed to pray daily, 44% of these actually claiming to pray several times a day. This is real hope for our nation. Pope Francis in Evangelii Gaudium starts his Apostolic Exhortation with a fundamental invitation to encounter Jesus in prayer, when he states “I invite all Christians, everywhere, at this very moment, to a renewed personal encounter with Jesus Christ, or at least an openness to letting him encounter them; I ask all of you to do this unfailingly each day. No one should think that this invitation is not meant for him or her, since “no one is excluded from the joy brought by the Lord”. The Lord does not disappoint those who take this risk; whenever we take a step towards Jesus, we come to realize that he is already there, waiting for us with open arms. Professor Mark Anthony Falzon, an anthropologist, in his observations to the Malta Independent of the 3rd February 2019 enforces the understanding that what we are seeing is no necessarily a decline in religious belief but rather a transformation. I quote, “A caveat is in order here, because while that for Sunday Mass attendance is a relatively straightforward statistic which measures practice (you either go or don’t), that for belief in God is an infinitely more complicated one.” In fact, Professor Falzon claims that we are not looking at a decline in religious belief, but rather a change in what people do with their beliefs – a change in religious practice. This transformation is understandable within a society which is becoming more individualistic, self-sufficient and too busy, losing touch with the beauty of being family, community and shifting towards social media friends, followers and likes. So why are people not attending? 20% because they do not agree with what the Church or what the priest say, 12% laziness, 12% lack of time, 10% they see Mass not relevant and 10% simply do not they like going to Church. Indeed 80% have nothing against the Church by are simply not motivated, they are waiting for the Church to give them a reason to go beyond mere rules of observance. They are looking for meaning, a reason to go, in day which like air above the surface of the water, they struggled to reach after a week drowned in the busyness of work, family life, commitments and whatever, and the last thing they want to go to is a place where they sit, detached from those around them, listening to a ritual of prayers and a homily which they struggle or are to sleepy to follow after a Saturday late night (or early morning for some). Interestingly in the case of the 16 to 24-years age group, there is even more hope and room for outreach then society wants to make us believe. Disagreement with the Church or the priest is far less significant at 5%, and the real reason is lack of time at 27% and laziness at 22%, if only as parents they find some sort of encouragement, and in the Church provides them the attention, friendships, fun and answers they look for. This should be what mass is all about after all, a meaningful community of friends, in celebration mode, sharing and expressing a joy that comes from understanding what Jesus did and what Jesus still does for us. I close with the words of Pope Francis in the more recent Apostolic Exhortation Gaudate et Exsultate, where he says, “Far from being timid, morose, acerbic or melancholy, or putting on a dreary face, the saints are joyful and full of good humour. Though completely realistic, they radiate a positive and hopeful spirit. The Christian life is “joy in the Holy Spirit” (Rom 14:17), for “the necessary result of the love of charity is joy; since every lover rejoices at being united to the beloved… the effect of charity is joy”. Having received the beautiful gift of God’s word, we embrace it “in much affliction, with joy inspired by the Holy Spirit” (1 Thess 1:6). If we allow the Lord to draw us out of our shell and change our lives, then we can do as Saint Paul tells us: “Rejoice in the Lord always; I say it again, rejoice!” (Phil 4:4). This is what mass should be all about. Then people will come. What next to be sacrificed at the altar of money in our country? The good name of our country, our environment, whatever we understand by good governance, national objectivity, our values, business integrity, you name it, as long as it makes money, sell or sacrifice it. Our children will be the biggest victims of the remorseless neoliberal society we are sowing today. The fast deteriorating environment to fill the pockets of the few, the spiral housing prices that are making the younger generation think more than twice whether to even consider marrying let alone having a family because they cannot afford it, the false belief and comfort that it will always be easy, the disconnect from the spiritual, making the fruits of a moral society like solidarity, ethics, care and concern for the common good and human dignity alien concepts that are perceived more and more as a hindrance to one’s personal achievements and happiness then what we should aspire for. 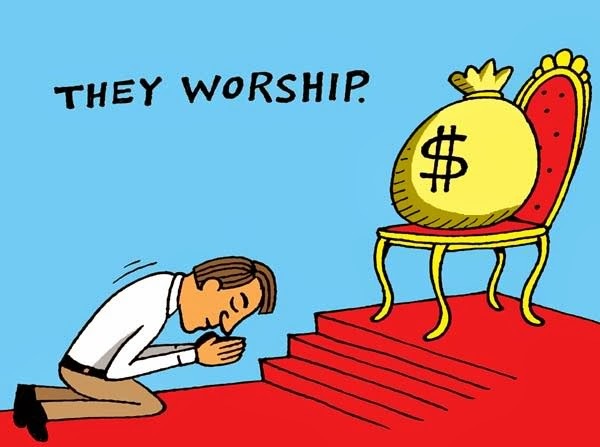 In essence money is fast becoming the only god we worship … until it lasts. However, the next sacrifice this county is being asked to offer in the name of money will not be a consequence for our own children, the next sacrifice at the altar of money will be our own children. Hoping that I am wrong, it appears that the mind of this Government is set on the legalisation of Cannabis for recreational use. Yes, you read correctly, for recreational use not the medical use, despite the emphasis Government made last year when legislating in Parliament in the name of creating jobs. It seems that the big fish around this industry are telling the Government that this is not enough and that if “we want jobs”, then he needs to legislate also for recreational cannabis. Jobs? Do we really need these jobs? Is the Government not saying we are at full employment? Just days ago the Jobs Plus Chief (former ETC) told us that next year we need to import 13,000 more workers to sustain our economy as is. So jobs for who? The Government concerned with the political back lash on this issue, is trying to dress its proposal as intended for “harm reduction”. Make no mistake about it, recreational cannabis is not about harm reduction but about a billion-dollar industry that wants to make money, to sell to a bigger consumer base. There is big money around this industry, with the reputable magazine Forbes in an article in March 2018, quoting ArcView Market Research and its research partner BDS Analytics, that over the next 10 years, the legal cannabis industry will see spending growth on legal cannabis worldwide hitting $57 billion by 2027. The recreational market will cover 67% of this consumption; while medical marijuana will take up the remaining 33%. No wonder the big push is for recreational cannabis. And who is the consumer target for this industry? Irrespective of the educational programs this Government is promising this year, the target will be our children, our young boys and girls, many in the more challenging phase of their life, pressured with exams, facing uncertainties and failings as much as success and fun. At an age more prone to the manipulative advertising campaigns that come like a tsunami and burry any educational campaigns, once cannabis becomes legal and mainstream. The Government will tell you that it has a mandate because it bunched the proposal in an electoral program that if you look for it over the internet you will not find. So I looked for what was said in the time of the last electoral campaign and what I found was the Prime Minister being quoted as saying that it was a high time that the country “holds a mature discussion on marijuana”. (Malta Independent 19th July 2017). A mature discussion is a far cry from electoral mandate. October last year, days before the Budget Speech, Parliamentary Secretary Julia Farrugia assured everyone that Malta was in no rush to follow Canada’s legalisation of recreational cannabis, but rather she emphasised that this year we should see an information campaign that highlights the dangers of drug use (MaltaToday, 18th October 2018). To me the conclusion of that article is, we will educate your children to understand the dangers of cannabis but then we will allow the fat cats to tempt our kids into consumption, the polite word, ADDICTION the crude reality. But of recreational cannabis is safe why do we need of an educational campaign? The answer is simple, because it is not safe, one can easily become addicted, lose motivation for life and live and work only for that addiction and eventually when cannabis will not be enough look for the harder drugs that the criminals (who will always be with us) like vultures willingly provide. Frankly the mind boggles me, we invest so much in our children, not only as parents, but also as a State from our taxes. A sizeable spend in education (not sure is spending it effectively enough, or indeed if enough, but that’s for another article) from the early years of child care, primary, secondary and a Tertiary system that even pays stipends, scholarship for postgrad, EU programs you name it we give it to them. We pass them through so much stress, (that I am completely against, but that we will be subject of another blog), because we want them to achieve. And when they are of age, we want to give them Cannabis … Seriously? Dump all our love, protection, investment, to fill the pockets of who this predatory industry? Last week PBS enters the fray, obviously on the instructions of the strategists thinking how to put in this piece of legislation without causing the stir and concern that indeed it should. PBS tries to feed us that it’s all ok by making a morning breakfast discussion, on the use of recreational cannabis. Tagging the program as representing different views about the subject, we discover that the only two people participated in the debate, John Ellul, the Chairman for the Open Debate on Cannabis Legalisation, who represents no Open Debate or Society but is the Government consultant on the legislation being prepared to legalise cannabis and Graziella Calleja, ReLeaf co-founder, an organisation set up recently to promote the legalisation of cannabis. These “different” opinions in the program “agree”. Surprise, surprise. As Lovin Malta’s portal reported “High-Ranking Maltese Official Lays Out Early Proposals to Legalise Recreational Cannabis”. The message John Ellul was sending was not the message of an openness to a mature debate that we were promised to have, but of a Government that already has its mind set with an advanced legislative proposal for the legalisation of recreational cannabis. The program focused on age limits, giving equal access to cannabis users, registry for users and not on explaining the harm cannabis does, rather its effects were played down or not mentioned. The tack is very shrewd, Government is not interested in having a debate on whether or not we should legalise cannabis for recreational use, Government is simply interested in the how with the least political damage possible. Clearly we are not in for an educational campaign we are in for a brain washing campaign to tell us it ok.
Will we here the views of Caritas, the Malta Association of Public Health Medicine (MAPHM), professionals and their associations like the Psychiatrists, Psychologists and the Sociologists. Are their opinions more important than those of declared lobbyists who have a big financial vested interest? If the Government wants to talk about harm reduction, then the last thing to do is get in bed with an industry that thrives on creating addictions. Shut the door, throw the keys and send the pushers in jail. We don’t need FAKE mantras like cannabis is a substance like many others, yes even cocaine, heroin, synthetic drugs, are substances. Re defining terms will not make cannabis less harmful. I believe the Parliamentary Secretary when she says she is against the legalisation of cannabis for recreational use. She is a mother; I cannot think of a loving mother believing otherwise. Once we open the door, it will be difficult to close, industry will always come for more. They already want more. I hope the Government will take heed of the warnings and positions of Caritas and the Malta Association of Public Health Medicine who have clearly expressed concerns on the legalisation of cannabis. Let’s put the interests of our children first, there place is not the next sacrifice to the alter of money. In the next blog I will tackle some of the arguments being made, and seek to understand better there implications. If interested in knowing more please speak to us. 48 NGOs, including Catholic Voices Malta, have voiced their heartfelt disappointment at the fact that no action has yet been taken on the stranded Sea-Watch vessel, with 49 migrants having been abandoned for 18 days. As a united front we have called on the Maltese government to put people before politics and allow the two stranded rescue vessels with 49 migrants onboard to be given shelter in Malta. As NGOs we met in front of Castille and asked for meeting with PM. 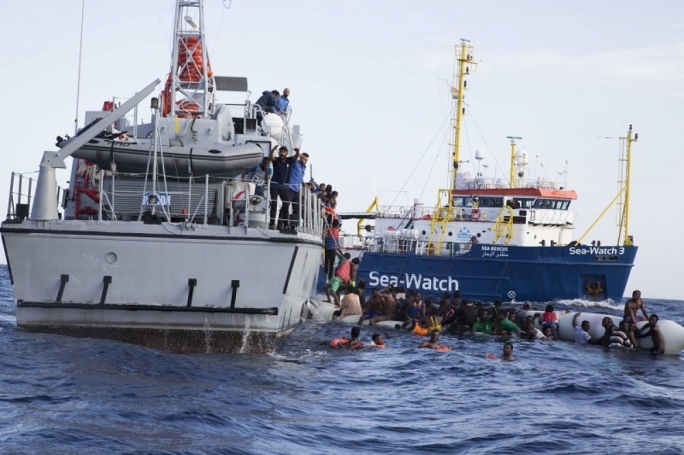 A spokesperson for Sea Watch International, the migrant rescue NGO, said earlier in the day that the psychological wellbeing of the migrants on board its vessel is deteriorating. The migrants have been on board the vessel since 22 December. 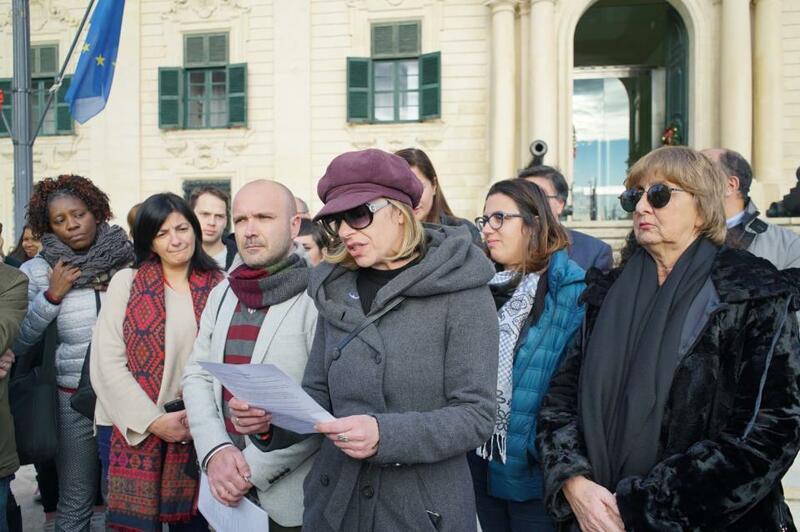 As NGOs we stood outside the Office of the Prim Minister at Castille and read our message to the Prime Minister, saying that this was indeed a European problem that requires a European solution but that this same argument cannot be employed in abdication of the nation’s responsibility to save lives. “This is nothing short of tragic and shameful. It can only mean that we have completely lost our humanity – as a people and a union of States that supposedly upholds the values of solidarity, respect for human rights and human dignity,” Integra Foundation director Maria Pisani said on behalf of all the organisations. Representatives of the organisation then entered the Prime Minister’s Office in Castille and presented the statement and the request for a meeting with the Prime Minister to one of his spokespersons. They were assured that an answer to their request for a meeting would be given in the coming hours. The Maltese Bishops Conference i.e. Archbishop Charles Scicluna, Auxiliary Bishop Joseph Galea Curmi and Gozo Bishop Mario Grech, wrote to the Commission of the Bishops’ Conferences of the European Union, urging European bishops to insist with their governments on action to help these stranded migrants. The letter said, “Ironically, as we Catholics were celebrating the birth of Our Lord who was rejected at birth, a group of 32 migrants was refused shelter by Europe after being rescued at sea off Libya. They have now been out at sea on a rescue vessel for no less than 13 days, only being allowed to enter Maltese territorial waters yesterday, Wednesday 2nd January, to shelter from a storm. We are appalled beyond words that, after 18 days of negotiations, 49 men, women and children remain stuck on a boat within sight of the Maltese shore. In spite of countless calls for solidarity, European Member States have not managed to find a diplomatic solution to the current impasse. This is nothing short of tragic and shameful. It can only mean that we have completely lost our humanity – as a people and a union of states that supposedly upholds the values of solidarity, respect for human rights and human dignity. We acknowledge the complex issues this situation raises, and agree that it is a European challenge requiring a European solution. However, this cannot be an excuse to abdicate our own responsibility, as individuals and as a nation, to save lives at any cost. The duty to save lives is not only a legal but also a moral imperative which can never be subjected to political conditions, such as the availability of concrete offers of relocation or the fear of creating a precedent. At this point, the question we must answer is simple: what is more important, scoring political points, or saving lives? For us, the undersigned organisations, there can be only one answer: people are more important. Today we are here to take a stand for life and dignity. We call on Malta to prioritize life and open its doors today. Ninsabu ixxukjati u bla kliem li, wara 18 il-ġurnata ta’ negozzjati, 49 raġel, mara u tfal għadhom miżmuma fuq dagħjsa ftit il-bogħod mill-art ta’ Malta. 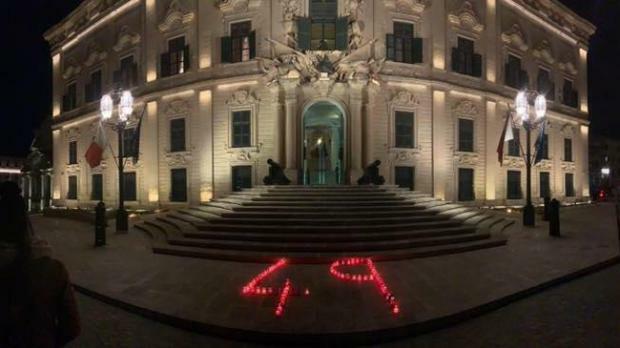 Minkejja talbiet numerużi favur is-solidarjeta’, il-membri ta’ l-Unjoni Ewropea għadhom ma rnexxilhomx isibu soluzzjoni diplomatika għall-impass preżenti. Din hi sitwazzjoni traġika u tal-mistħija. Ifisser b’mod ċar li tlifna kompletament l-umanita’ tagħna – bħala poplu u bħala Unjoni ta’ stati li suppost jiddefendu l-valuri tas-solidarjeta’, tar-rispett tad-drittijiet umani u tad-dinjita’ umana. Nifhmu li din is-sitwazzjoni tqajjem kwistjonijiet kumplessi, u naqblu li hija sfida Ewropea li tirrikjedi soluzzjoni Ewropea. Madankollu, ma nistgħux nużaw dawn l-argumenti bħala skuża biex nabdikaw ir-responsabilta’ tagħna, bħala individwi u bħala nazzjon, li nsalvaw il-ħajja akkost ta’ kollox. Id-dmir li nsalvaw il-ħajja m’hijiex biss legali imma wkoll dmir morali li qatt ma jista’ jkun sottomess għall-kondizzjonijiet politiċi, bħad-disponibilita ta’ offerti konkreti ta’ rilokazzjoni jew il-biża li jinħoloq preċedent. F’dan il-punt, il-mistoqsija li rridu nirrispondu hija din: X’inhu l-iktar importanti, li nagħmlu punt politiku jew insalvaw il-ħajja? Għalina, l-organizzazzjonijiet firmatarji, hemm biss risposta waħda possibli: in-nies huma iktar importanti. Illum qegħdin hawn biex nieħdu pożizzjoni favur il-ħajja u d-dinjita’. Nagħmlu appell lil Malta biex nagħtu priorita’ lill-ħajja u niftħu l-bibien tagħna illum.